Here are some lovely things people have said about Find Your Thing the book, and Finding Things in general. I’m so grateful that people ‘get’ my Thing! At high speed, whether you’re an experienced or a new business owner, Lucy will give you clarity on how to market your Thing so that it is right for both you and your customers. 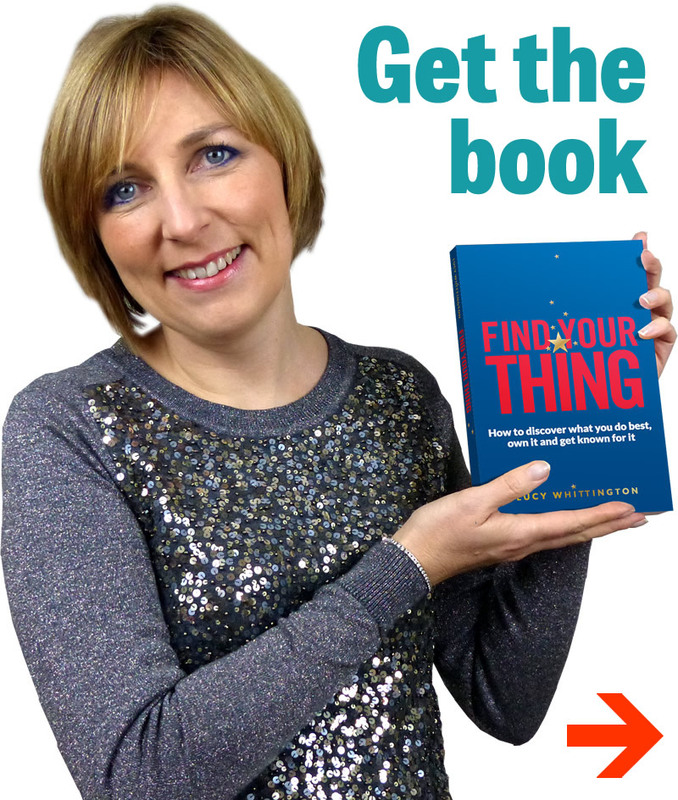 Lucy quickly sifts through all the stuff you think you should be doing and finds, polishes and creatively packages the gem that you are so brilliant at and comes so naturally you don’t even realise it exists – your thing! She has such an amazing way of explaining things that every time you speak to her you are guaranteed an ‘aha’ moment! It’s true! My Thing was right there all the time and Lucy managed to get to it within a few hours. In 15 years of running my own business it now makes sense why I love some areas if my work much more than others. I’d recommend anyone who thinks there’s something ‘more’ there to have a chat to Lucy. Since Lucy helped me find my Thing, Fame Name & Story, it has been so much easier creating my marketing message and being able to convey clearly what it is that I do and why I’m so special and unique as well as getting the right clients which has helped me significantly grow my business. Lucy has an amazing ability to get into your head by asking questions that make you think about things in a different way. Lucy has an honest, straight-to-the-point way in helping you identify and clarify your Thing, delivered with an infectious personality. I’ve got so much information in this head of mine as I’ve been trying to work out how to put it into a package so people can buy it. The process has been absolutely fantastic. I’ve been blown away. Her razor sharp mind came up with some extra twists which took my story to another level still. Brilliant. There’s no-one better to help you get clear on your Thing. Lucy is amazingly gifted at seeing people’s Thing and she does it at the speed of light! Lucy is brilliant at her ‘Thing’ and is so enthusiastic and intuitive at helping everyone else find theirs.